September 17 is Constitution Day, commemorating the signing of the U.S. Constitution in 1787. Sometimes we take the Constitution for granted, so let’s take a moment to appreciate the Constitution’s thoughtfulness and foresight. It guarantees that we have basic inalienable rights. It certifies that we grant limited authority to our government. It gives us a framework for keeping power with individuals and states, if we choose to keep it. I challenge you to read or re-read the U.S. Constitution. Learn or remind yourself about the principles on which the United States was founded, and share them with at least one other person. If you’re in school or spend time with school-age children, the National Constitution Center has a helpful “Constitution Day 2015 Bill of Rights Student Guide.” They also have lesson plans and resources for educators and parents. Why is understanding the Constitution so important? We need to know our rights – so we can protect our freedoms. We need to know our history – so we can decide our future. We need to uphold our rights, freedoms, and responsibilities – so we can hold each other accountable. Free bookmarks! 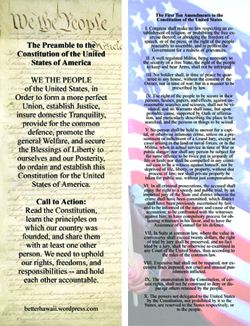 To celebrate Constitution Day, I have free U.S. Constitution bookmarks with the Preamble and the first 10 Amendments. If you would like a U.S. Constitution bookmark for yourself or your classroom, email me at rachelle09 at yahoo.com (substitute “@” for “at”) and the number of bookmarks you need. I’ll gladly share these bookmarks until I run out. I’m happy to report that I’ve run out of bookmarks to give away. Thank you to the schools, colleges, and organizations who requested bookmarks – you are keeping the principles of the Constitution alive. Happy Constitution Day! To celebrate three and a half years of Better Hawaii, I’m launching my first giveaway – the book I reviewed this month: my copy of “Mom Entrepreneur Extraordinaire: Top Experts Share Strategies for Success,” a collection of 21 practical essays and personal stories, written by successful mom entrepreneurs to help other moms juggle family and career. 1) Visit the “Mom Entrepreneur Extraordinaire” book review by July 31, 2013. 2) Write about how you juggle family and work. Share your favorite tip for family, time management, or business. Post an inspirational quote. Or suggest a good book. 3) Check this page after August 1, 2013 to find out the winner. If there’s a good response to the giveaway, I’ll try to offer more giveaways in the future. Giveaway rules: This giveaway will end on July 31, 2013 and is open to United States residents. One entry per person, please (though feel free to share as many tips and comments as you like). No purchase or registration necessary (you don’t have to follow my blog). A winner will be picked on or around August 1, 2013 and will be posted on this page. If the winner cannot be reached within one week, a back-up winner will be picked on August 8, 2013.